LONDON--(BUSINESS WIRE)--Technavio’s latest report on the global operational intelligence (OI) market provides an analysis of the most important trends expected to impact the market outlook from 2017-2021. Technavio defines an emerging trend as a factor that has the potential to significantly impact the market and contribute to its growth or decline. The market size of operational intelligence industry is expected to reach USD 2.6 billion by 2021, growing at a CAGR of over 12% through the forecast period. EMEA will be responsible for generating the maximum incremental growth in the market through the forecast period. The impressive growth in EMEA is likely to be driven by the banking, financial services, and insurance sector, which is increasingly adopting big data services to minimize risk and counter cyber-attacks. Additionally, increasing investments made into emerging technologies like software as a service (SaaS), mobile computing, social networks, and big data analytics, will start to make an impact on the growth of the software market in the region. “One of the major trends in the market is the integration of operational intelligence with social media. Many enterprises are utilizing social media platforms to reach out to potential customers worldwide. Organizations are investing in cloud-based operational intelligence solutions and business intelligence services to improve their decision-making and data-handling capabilities,” says Amit Sharma, one of the lead analysts at Technavio for enterprise application research. Cloud-based operational intelligence analytics applications aid companies in analyzing sales, market trends, pricing, and customer behavior, and streamline the business decision-making process and understand the business performance. This is leading to the high adoption of cloud-based operational intelligence analytics solutions. Smart devices are witnessing an increasing adoption by consumers worldwide, leading to increase in work-from-home options to increase employee mobility and output. This is seeing an increasing number of employees taking care of businesses from remote locations, which has led to mobile operational intelligence applications that enable users to access high-quality services on the move. This will significantly impact the market through the forecast period. “With rising responsiveness among vendors, service providers are increasingly exploring and developing new capabilities in cloud computing. Vendors are providing flexible and agile technology solutions that are customized per customers' requirements. The solutions are becoming a popular option for deploying enterprise software due to cost benefits,” says Amit. With the increasing popularity of and benefits provided by cloud computing, organizations are swiftly transferring all their data to the cloud. Cloud-based technologies allow professionals to collaborate seamlessly within the organization by improving communication between business and finance operations. With more organizations shifting to cloud-based systems, the operational intelligence market will see a marked growth through the forecast period. Become a Technavio Insights member and access all three of these reports for a fraction of their original cost. As a Technavio Insights member, you will have immediate access to new reports as they’re published in addition to all 6,000+ existing reports covering segments like cloud computing, data center, and M2M and connected devices. This subscription nets you thousands in savings, while staying connected to Technavio’s constant transforming research library, helping you make informed business decisions more efficiently. 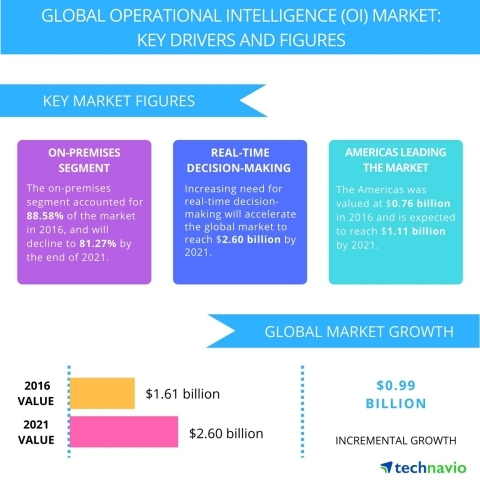 Technavio’s latest report on the global operational intelligence (OI) market provides an analysis of the most important trends expected to impact the market outlook from 2017-2021.